The Bobcat Chronicle: Emilie Swenson - Senior Sportsmanship Award! Emilie Swenson - Senior Sportsmanship Award! At the All-Sports Banquet Sunday night Bates Swimming and Diving received another "All-Campus" award. Emilie Swenson was voted on by all Head Coaches as the Senior Women Sportsmanship winner! We had an unbelievable senior class of women this year, and Emilie, although the winner, will surely agree she was part of an amazing class that all did a phenomenal job leading by example - and displaying exactly what Bates Swimming and Diving is all about. There is not a more important award in my book. Sportsmanship, respect, hard work, and humility are the fundamental ingredients toward building a successful program that not only wins, but continues to do so for years - with both approval and class. Emilie was by far one of the most talented leaders I have ever worked with. Her role as a captain came naturally - and her encouragement toward others was second to none. Simply put, she had the "knack." She could easily send an email - or say a few words - that were exactly what a coach wanted an athlete to say, and, more importantly, exactly what the team needed to hear. She always did it in a positive manner - and always helped others succeed. And as far as sportsmanship, well her innate disposition made it very easy for all her competitors and teammates to not only respect her talent, but want to get to know her. She was always the first to say good job, shake a hand, and lead the team in a cheer that congratulated our opponents. 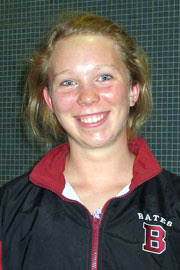 There is just not a nicer young women around - or one that has the "greater good" in mind - for both her team and Bates. She has had 3 coaches in four years, and I know all of us would have benefited from four in a row with her!